Welcome to Barkman & Smith Physical Therapy’s Guide to Adult Femur Fractures. 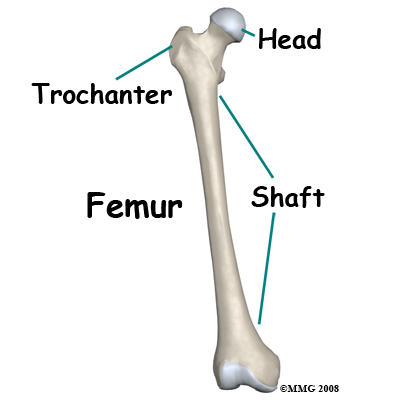 The thigh bone, or femur is the longest and strongest bone of the body. It takes a lot of force to break the femur in an adult so it is often accompanied by other injuries. The fracture is a disabling problem, severely limiting mobility until it is stabilized. Until recently the most common way to treat a fractured femur was to apply traction, the source of a thousand cartoons and jokes. Fortunately, modern treatment usually stabilizes the bone quite early on and allows you to move around on crutches. The femur extends from the hip to the knee and represents one fourth of the height of the average adult. You can feel the lower end of the femur at the knee. The upper end is deeply buried in the muscles at the hip, but you can feel the bony bump of the greater trochanter on the outer side of the hip. The shaft of the bone is a hollow tube with dense strong compact bone on the outside and fatty tissue with no structural strength inside. The shaft breaks when impact, bending, twisting or compression stresses the bone. How do fractures of the femur commonly occur? 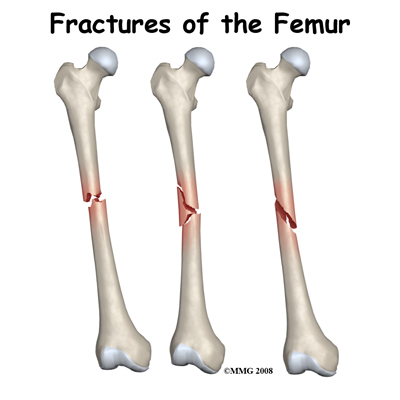 Femur shaft fractures occur in high energy traumas such as motor vehicle accidents and falls from a height. Gunshot and blast injuries also cause severe open fractures of this area. Lower energy accidents which may cause a fracture of the thigh bone include collisions in sports, skiing injuries and twisting injuries. Impact against the thigh causes a bending force that compresses one side of the bone and stretches the other. 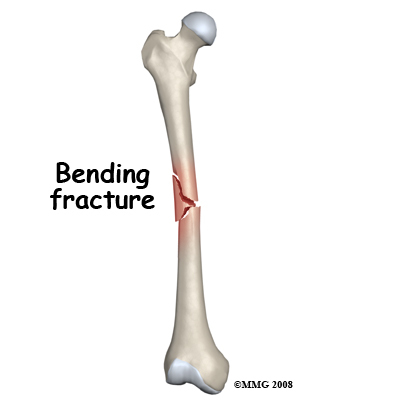 This may result in a short oblique fracture or a three-part fracture with a short triangular fragment. A twisting force can be applied to the thigh bone when the foot or lower leg is trapped and the weight of the upper body is rotating. 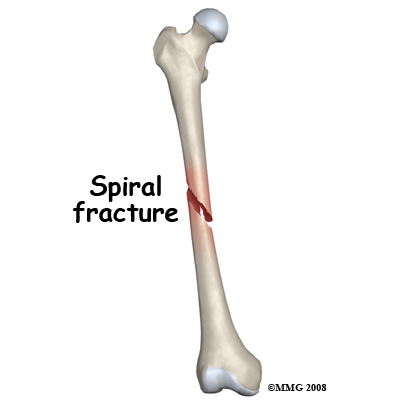 This causes a spiral fracture of the bone. 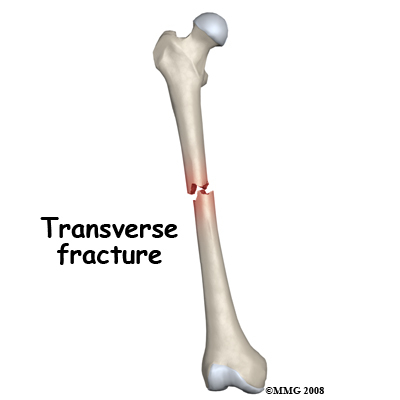 Compression along the line of the bone causes a transverse fracture. This may occur in a car accident when the knee strikes the dashboard and the force is transmitted up the bone. The bone injury is only a part of the total picture when a fracture occurs. Injury to the muscles, tendons, ligaments, skin, blood vessels and nerves may be more important than the broken bone. This is particularly true of femur fractures. The force needed to break the thigh bone often causes a lot of damage to the other structures in the thigh. An open fracture in which the bone comes out through the skin is an especially severe problem. What symptoms do femur fractures cause? The main immediate symptom from the injury is pain in the thigh and inability to use the leg. It is very rare for anyone to be able to walk on a broken thigh bone and it shouldn't be attempted. The leg is often unstable and does not move as one. Usually, the fractured leg will be shorter than the other one and distorted. There will be swelling and tenderness at the site of the fracture. There may be loss of sensation and movement of the foot if the nerve or blood supply has been affected. If the bone has come through the skin the wound will be obvious. Internal bleeding from a broken femur can be significant causing rapid heart rate and low blood pressure leading to shock. Pain will continue to be significant for several weeks as the thigh bone heals but this will be lessened if the bone is stabilized by surgical fixation. Swelling, tenderness and massive bruising are also symptoms that often last for weeks. First aid evaluation at the scene of the accident will include questions about the nature of the accident, site of pain and ability to move the leg. The shock status of the patient will also be evaluated. The leg will be assessed for wounds, sensation and blood supply. Usually the leg will need to be splinted prior to transport to the hospital. The patient should be kept warm and still. In the Emergency Room the patient will be further assessed for shock and blood loss as this can be significant. The patient will be checked carefully for other injuries especially in the case of a high energy accident with its potential to cause multiple traumas. The vascular and nerve supply of the limb will be carefully checked. The limb will be stabilized with splints, sandbags or skin traction. Careful palpation of the leg, paying attention to the knee and shin as well as the thigh and hip, may give an indication of other injuries. Routine tests are done to evaluate blood loss and general body biochemistry prior to an anesthetic. X-rays of the thigh are a vital part of the evaluation of this injury. CT or MRI scanning is not usually needed for these fractures. The standard x-ray views are an anteroposterior (AP) view of the whole thigh bone from hip to knee and a lateral view of the shaft. It is extremely important to get satisfactory x-rays of the hip and knee joint to make sure these regions are not also fractured. Even with good X-rays a small number of hip fractures are not discovered at the initial evaluation. A few years ago this type of fracture was most commonly treated in traction. However, in North America the majority of patients with a broken thigh bone are now treated by surgery. This surgery consists of straightening (reducing) the fracture and stabilizing it with a metal rod passed inside the bone and fixed to the bone at the top and bottom to prevent shortening and rotation. Traction may be recommended in some cases where the risks of a more major operation seem too great. A metal pin is passed through the bone either just above or just below the knee. Slings and splints support the leg, and 15-25 lbs or 7-11kg of weights are attached by cords and pulleys to the pin. The principle behind using traction is that pulling on the bone both straightens it and keeps it still. The traction must be maintained until the healing process is advanced to the point where the fracture will not move when the traction is removed. This usually takes six to eight weeks in an adult. Following this period in traction the fracture must still be protected in a body cast, otherwise it is liable to shorten, angulate or rotate. The body cast, from chest to ankle is maintained for some months until the fracture is united. If the fracture has a very stable pattern it may be possible to treat it in a cast brace after the initial period in traction. Apart from the significant inconvenience of prolonged bed rest for traction, prolonged immobilization, and a body cast, this way of treating the fracture was found to cause a number of problems such as malunion, nonunion, stiffness, weakness and poor functional recovery from the injury. Thus the reason for treating a fractured femur by surgery is because the results of non-operative treatment are not consistently good. Surgery is done under general or spinal anesthetic. The bone is straightened and kept straight by traction. A small hole is then made at the top of the thigh bone and a thin wire is passed down inside the bone, crossing over the fracture and into the lower fragment. The inside of the bone may be reamed (cleared out) to ensure a snug fit. 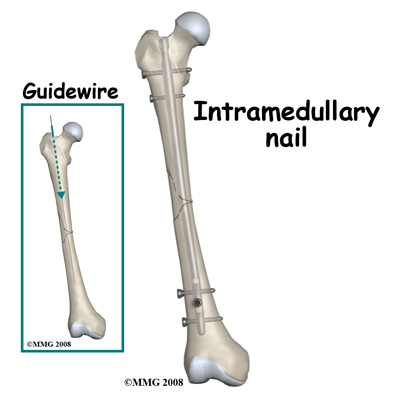 Next an Intramedullary Rod (IM Rod or IM Nail) is passed over the guide wire inside the femur and is secured with screws at either end. With some fracture patterns or with open fractures, an external fixation device may be used. To apply an external fixator, the bone is straightened and large threaded pins are passed into the bone fragments above and below the fracture. These pins are attached to a rigid framework outside the thigh, which holds the fragments in position while the healing process takes place. 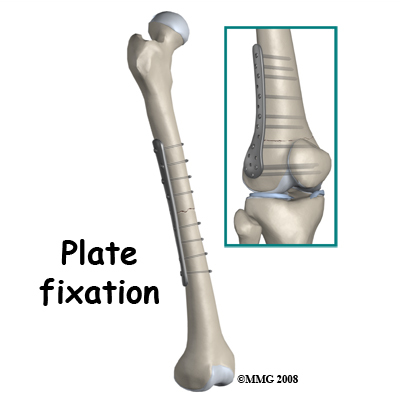 When the fracture extends far down the shaft towards the knee a plate may be used. The greatest advantage of operative treatment of a fractured femur is that it allows the patient freedom to move, to walk on crutches very soon after the surgery and to leave the hospital early. The bone is not healed by the surgery, but it is held still to improve the chances of healing. The quicker recovery of normal movement of the hip and knee prevents future problems of stiffness and weakness. Implants are often removed after the bone is healed. The external fixators are always removed. Plates are also removed quite frequently as they may give the patient some symptoms and can often be felt through the skin. Removal of IM Rods is done only when they cause symptoms. The removal operation is relatively simple and recovery is usually quite rapid (six weeks) however, the bone may need some time to regain full strength after the hardware has been removed. When there are no symptoms attributed to it, removal of the hardware is controversial. Some surgeons advocate it because the presence of a plate or a rod may weaken the bone long term; others leave the hardware in and point to the small but significant incidence of re-fracture in the three months after the implant is taken out. What happens as I recover from surgery? The normal uncomplicated process of bone healing takes six weeks to obtain 50 percent of eventual bone strength, three months to reach 80 percent bone strength and consolidation and remodeling of the fracture site may continue for 18 months. The consequences of this timetable are that the fracture needs protection for the first three months. Early on this means using crutches and not putting much weight through the injured leg otherwise the fixation will fail. In order to determine when more weight can be put through the thigh your orthopaedic surgeon will monitor the healing with x-rays at intervals. When new bone formation (callus) is evident bridging across the fracture, you may be encouraged to put more weight on the leg. Even though actual bone healing may be at 50 or 80%, overall recovery from the fracture and surgery also requires adequate muscle strength and endurance as well as joint range of motion and control. Physical Therapy at Barkman & Smith Physical Therapy can help you achieve this. Rehabilitation at Barkman & Smith Physical Therapy will begin as soon as your surgeon recommends it. Sometimes therapy will be recommended even before you are allowed to fully weight bear. In other cases, rehabilitation will not be recommended until full or nearly full weight bearing begins. Each surgeon will set his own specific restrictions based on the type of fracture, surgical procedure used, personal experience, and whether the fracture is healing as expected. Even if Physical Therapy for the injured leg has not yet begun, at Barkman & Smith Physical Therapy we highly recommend maintaining the rest of your body’s fitness with regular exercise. You can use an upper body bike if you are non-weight bearing or may even be advised to do non-weight bearing exercises in a pool. A stationary bike is often the best cardiovascular activity once weight bearing begins. Weights for the upper extremities and other leg are also strongly encouraged. Your Physical Therapist at Barkman & Smith Physical Therapy can provide a program for you to maintain your general fitness while you recover from your surgery. If you are still using crutches by the time we first see you at Barkman & Smith Physical Therapy, your Physical Therapist will ensure you are using them safely, properly, and confidently and that you are abiding by your weight bearing restrictions. We will also ensure that you can safely use your crutches on stairs. If you are no longer using crutches, or once you no longer need them, your Physical Therapist will focus on normal gait re-education. Until you are able to walk without a significant limp, we recommend that you continue to use your crutches, or at least one crutch or a cane/walking stick. Improper gait can lead to a host of other pains in the knee, hip and back so it is prudent to use a walking aid until near normal walking can be achieved. Your Barkman & Smith Physical Therapy Physical Therapist will advise you regarding the appropriate time for you to be walking without any walking aid at all. Patients may experience pain when they initially start to put weight through their leg. This pain can be from not using the joints and muscles regularly or it may be from concurrent soft tissue injury that occurred when you fractured your thigh. During your first few appointments at Barkman & Smith Physical Therapy your Physical Therapist will focus on relieving your pain. We may use modalities such as heat, ice, ultrasound, or electrical current to assist with decreasing any pain or swelling you have around the surgical site or anywhere down the extremity. In addition, your Physical Therapist may massage your leg and ankle to improve circulation and help decrease your pain. The next part of our treatment will focus on regaining the range of motion and strength in your entire lower limb. Your extremity will look and feel quite weak after not using it for an extended period. Your Physical Therapist at Barkman & Smith Physical Therapy will prescribe a series of stretching and strengthening exercises that you will practice in the clinic and also learn to do as part of your home exercise program. We will focus particularly on gaining range of motion in your knee as the knee can easily become stiff if early motion is not encouraged. In regards to strength we will focus on the muscles of your hip and thigh but may even give you exercises for areas such as your ankle or back as these areas help to support the lower limb when you are weight bearing. An electrical muscle stimulator may be used to assist your muscles in contracting as you do your exercises, which will assist you in more rapidly gaining your strength back. Exercises may also include stationary cycling and the use of Theraband or weights to provide some resistance for your lower leg. If necessary your Physical Therapist will mobilize your joints. This hands-on technique encourages the stiff joints of your hip, knee, ankle and foot to move gradually into their normal range of motion. Mobilization of the joints may be combined with assisted stretching of any tight muscles around the surgical site. Fortunately, the initial phases of gaining range of motion and strength after a femur fracture go quickly. You will notice improvements in the functioning of your whole leg even after just a few treatments with your Physical Therapist at Barkman & Smith Physical Therapy. As your range of motion and strength improve, we will advance your exercises to ensure your rehabilitation is progressing as quickly as your body allows. As a result of any injury, the receptors in your joints and ligaments that assist with balance and proprioception (the ability to know where your body is without looking at it) decline in function. A period of immobility and reduced weight bearing will add to this decline. If your balance and proprioception has declined, your joints and your limb as a whole will not be as efficient in its functioning and the decline may also contribute to a potential injury in the future. As a final component of our treatment your Physical Therapist at Barkman & Smith Physical Therapy will prescribe exercises for you to regain balance and proprioception. These exercises might include activities such as standing on one foot or balancing on an unstable surface such as a wobble board or a soft plastic disc. Advanced exercises will include agility type exercises such as hopping, jumping or moving side to side. Eventually we will encourage exercises that mimic the quick motions of the sports or activities that you enjoy participating in. Once the fracture shows x-ray signs of consolidation you can use the leg more normally and return to heavier activities and sports. This stage is usually between three and 18 months post-injury and depends just as much on the recovery of muscle strength and endurance as it does on the recovery of the bone. The fact that the healing process may go on for 18 months means that the symptoms of aching, throbbing, swelling and weakness may continue for a long time after the bone appears 'healed' on x-ray but should gradually decline and then disappear. Generally, the strength and stiffness one experiences after surgery to repair a femur fracture responds very well to the Physical Therapy we provide at Barkman & Smith Physical Therapy, however, if your pain continues longer than it should or therapy is not progressing as your Physical Therapist at Barkman & Smith Physical Therapy would expect, we will ask you to follow-up with your surgeon to confirm that the surgical site is tolerating the rehabilitation well and ensure that there are no hardware issues or complications that may be impeding your recovery. Overall the prognosis for full recovery from a fractured thigh bone is encouraging. Most people’s bones heal in a good position and they recover near normal function. Most of those who do not recover full function have had the injury or its treatment complicated by one or more of the problems discussed in the next section. A fracture of the shaft of the thigh bone is a serious injury with the potential for severe long term problems. It is also commonly associated with other injuries. 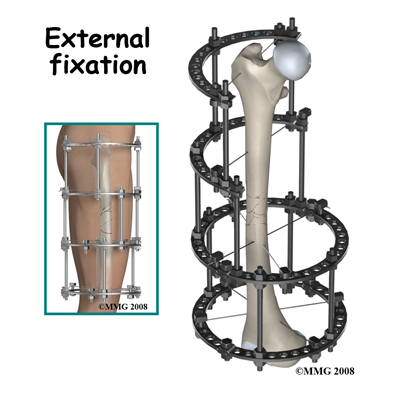 Modern treatment with IM rod fixation fixes the fracture in a good position and allows early mobilization, pain relief and discharge from hospital. Complications from this type of treatment are relatively rare and it is normal to return to full activity however full recovery can take up to 18 months.